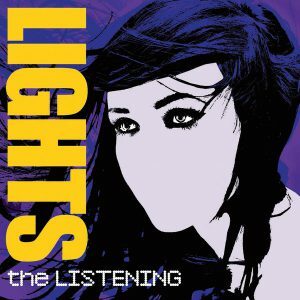 The Listening is the debut album of Canadian synthpop solo artist Lights. It is a low key outing that puts her voice, which is so sickly sweet that it could give you diabetes, at the front and centre of each song. This isn’t inherently a bad thing but the music itself can feel secondary at times and this approach leads itself into a by-the-numbers result when looking at this in the context of a full album. Saviour introduces the listener to The Listening and sets the tone nicely while also making use of auto-tune software that isn’t necessary because Lights has a voice that should be able to stand on its own merits. It is also prominent on the title song and its use might simply be a by-product of the pop trend for auto-tuning voices that arose in the mid to late 2000s. All but two songs are under three and a half minutes long so their shortness will lend itself to a good amount of replay value on individual songs rather than as a whole album. Both Pretend and The Last Thing on Your Mind take on a downbeat mood and feature an acoustic guitar which adds to the sincerity of the performance with the latter breaking out of the mould further by having a distorted guitar playing in the crescendo to the finale. This also has Lights singing far more intensely over a comparatively rapid paced beat and makes it a standout moment for the album. Being placed in the middle of the album, it is a good way to break up the pacing although it would have made for a better closing song. Lights sounds rabid in her choppy delivery of the second verse of Ice and combined with the frantic synthesiser part that follows it, it quickly becomes a stand out moment like Pretend (Reprise), a reimagining of Pretend as a piano ballad that strips away all of the polish associated with the synthpop sound and gives a glimpse into another side to Lights. Many listeners will undoubtedly be won over by Lights’ voice alone but since The Listening has Lights and her co-producers working within certain parameters and only ever tip-toe across the line, which is what yields some of their best results, it shows that there is room for growth.